Easy-to-install and use, a single kayak hoist storage-lift, with its robust engineering, thick rope, and safety latch, is designed to support a 50, 100, 125 or 150-pound capacity. Safe, easy-to-use, and affordable, the canoe and kayak hoist systems are available in a variety of different designs, with such models designed to hold a single seater kayak with a maximum load capacity of 50-lb. to the more heavy-duty, vertical stacking hoist, designed to hold multiple canoes and kayaks with a maximum load capacity of 300-lb. or more. 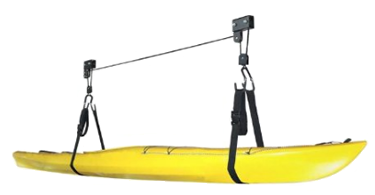 A ceiling-mounted hoist, with its safety release mechanism (avoids accidental release), fully adjustable straps (keeps objects secure), and rubber coated hooks, protects a Native Watercraft, Hobie, Ocean, Perception or Old Town manufactured kayaks from scuffs or abrasions and suspends from a ceiling up to 12-ft tall. Fits all types of kayaks: Sit in or Sit on Top Kayaks, Tandem Kayaks, etc. Safe for a single person to operate, the easy-to-use rope/pulley mechanism of the hoist raises and lowers a load in a flat, solid position via 2 thick ropes (one each end of the kayak), with floor to ceiling lifting taking a matter of minutes. Ideal for mounting on open rafters or finished ceilings - Just attach the supplied hardware (lift assemblies, hook pulleys, rope, screws, etc.) to an unobstructed area, secure a canoe or kayak with the reliable straps and hooks, and pull on the dual pulleys to lift the paddling machine up into the air. Push-button operation is also an option with the motorized electric hoist models. Raise or lower a kayak (or similar objects at a higher weight limit - up to 220-pounds) at the push of a button. Operated via a standard 110v outlet, a quiet, reliable-performance 3/4-HP motor, and a flex-cord connected hand-control, the motorized hoist offers a smart choice to deal with clutter and free-up storage space in a garage. At a higher cost than the manual hoist, though it does eliminate the strenuous effort required to man-handle the heavier kayaks into position. BAC Industries, ProSource, Harken Hoister, and Racor manufacture a high-quality selection of kayak storage racks to raise a 9'6 to 17'9 paddling machine or similar object to a safe, suspended ceiling height. Storage Racks - a simple floor-standing solution to store and organize multiple kayaks, canoes, surfboards, or other related equipment. Systems accept paddling machines up to 20-ft, with hull sizes up to 30-inch wide, and a weight limit of 75-lb. Freestanding, light weight, and super portable. Wall Cradles - constructed in a reinforced, steel-plate, and foam padded, the reliable cradles or paddles offer quick, easy installation on a wall, and at 15-inch deep, are designed to hold almost all kayak models (up to 100-lb. weight capacity). Load in seconds, with no need for straps. Boat Hanger - easily adaptable, a versatile hanger features 2 loops of webbing attached via ceiling anchors to secure 1 to 3 kayaks in a horizontal position against a wall. Extra loops available to increase the storage capacity. Also, if it starts to become a difficult or tiring state to load a sizable kayak onto the roof rack of a SUV, truck or similar vehicle; avoid the stresses and reverse the SUV into a position under the ceiling-mounted kayak, and slowly lower via the lift hoist pulley system, to rest the paddler on a roofs J rack or similar carrier kit. Versatile in its storage abilities, a multi-use garage hoist is also efficient at lifting or lowering a wide variety of heavy objects, such as bicycles, garden tools, ladders, deck furniture, dock boxes, sports apparatus and other such equipment often confined to a garage or workshop. All in all, the heavy-duty kayak hoist, with its simple-to-use operation, offers a practical solution to raise or lower up to 150-pounds of paddling equipment of other workshop clutter to reclaim valuable floor space.